Diane is smoking a Players Light and waiting for the bus. Her feet are killing her in those heels. She wants to take them off, but doesn't because she's scared of the dirty pavement. Spit pools. Wads of gum. Or worse. Syringes, broken glass, Anthrax disease. Diane pulls on the cigarette and inhales deeply. She feels her body relax. She'd told Grant, her date that she didn't smoke. She also told him she wasn't really hungry, and only picked at her dinner. At the end of the meal, her food looked gnawed on by vermin. When she gets home, Diane will heat up a Michelina's frozen entree and eat in front of the computer. She'll log onto Match4U and see if anyone's messaged her. There are a lot of singles out there. Plenty of fish in the sea. But some are sharks and some are sardines. These days, Diane feels like giving up. She wants to stop going on dates, stuffing herself into tight shirts, jacking up her breasts with a push-up bra and applying her: "Kiss me Coral" long-lasting lipshine. The bus is late. Diane shifts her weight from one foot to the next, considers removing her shoes again and lights another cigarette. 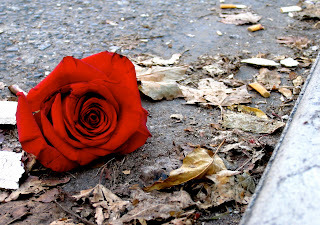 Then she notices, among the dead leaves and bits of plastic and trash at her feet, a rose. And it's huge and absolutely bursting, the reddest rose she's ever seen. A song comes into her head: "Dance me to the End of Love." And Diane starts humming and even though her feet are about to fall off, she begins to sway. "Dance me to your beauty with a burning violin. Dance me through the panic till I'm gathered safely in"
She performs a turn and feels her skirt spin out around her legs. The burning cigarette arcs with her arm, its tip turned into a flare. "Lift me like an olive branch and be my homeward dove"
Diane's out of breath now, but she keeps dancing. Click here and sing along with Diane. "jacking up her breasts with a push-up bra", what a great line! Your descriptions are pitch perfect.